When Autumn de Forest was 4 years old, she brought home an art project from preschool: a watercolor she called “Elephant.” Her depiction of the animal was abstract, with pronounced brushstrokes that her parents found very deliberate and startlingly artistic. Over the next several months, Autumn created more art, much of it remarkable, and all of it suggesting a strange and precocious talent for shapes, colors and patterns. “At first we did think it was a fluke,” said Autumn’s mother, Katherine, who appeared on TODAY Thursday with her daughter. “We were scratching our head and thought it was an anomaly and interesting,” she told Matt Lauer. The masterpiece moment came about a year later at the family’s Las Vegas home, when Autumn was 5. One day she walked into the garage where her father was working and asked if she could paint something for fun. He gave her a paintbrush — the kind for painting houses —some stain and a piece of plywood. In about one year’s time, Autumn de Forest, who turns 9 this month, has become one of the art world’s youngest and biggest stars. Prolific and versatile, she has produced a range of work representing multiple styles: abstract impressionism, surrealism and pop art. Her paintings bring to mind the work of masters like Picasso, Warhol, Dali and Matisse. This year, Autumn has sold dozens of her paintings at auction for a total of about $250,000. The highest price paid for her work is $25,000, for the painting “People Are Strange,” inspired by The Doors song of the same name. The next auction for Autumn’s work will be held online Oct. 14. 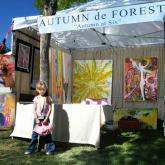 The de Forest family hired art promoter Ben Valenty to handle sales of Autumn’s art. Valenty, based in Orange County, Calif., has acted as an agent for several other child painters such as the Romanian-born prodigy Alexandra Nechita (whom he met 15 years ago), and is largely responsible for creating the market for child artists in the art world. His relationships with some of his clients have been contentious — a few have sued him over earnings — but the de Forests trust him. “I was skeptical at first,” Doug said, “but he does exactly what he says he is going to do.” And so far, Valenty’s efforts have resulted in financial rewards that would be the envy of any artist — let alone one whose work was not seen in public until spring 2009. Doug admitted that he has encountered some people who question the authenticity of Autumn’s work: “They don’t think she did it.” To preclude controversy, he has recorded Autumn on video at work as proof. Autumn has never taken formal instruction, although her parents believe she would benefit from it and would like her to start. So far, her work is the result of pure intuition, imagination and inspiration. She painted “The Messenger,” depicting a fetus attached to its umbilical cord, after going to an exhibition with her mother at age 5 and becoming fascinated with a display of a pregnant woman. Neither of her parents is a visual artist; Doug is a musician, Katherine an actress. There are, however, several accomplished and collected painters in Doug’s family: Lockwood de Forest (1850-1932), George de Forest (1855-1941) and Roy de Forest (1930-2007), who was part of California’s “funk art” movement.